Join us Sundays at 8:00 a.m. or 10:00 a.m. 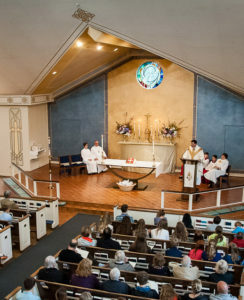 In the Episcopal Church, the principal weekly worship service is the Holy Eucharist, also known as: the Lord’s Supper, Holy Communion, or Mass. 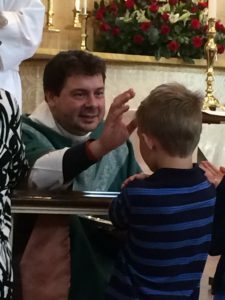 At St. Martin’s-in-the-Field, all are welcome to come to the altar rail to receive communion or a blessing, no matter age or denomination. The Holy Communion consists of two parts, The Liturgy of the Word and the Liturgy of the Table. 8:00 a.m. Holy Eucharist, Rite I: A quiet reflective service for those who like to start their Sunday with the simplicity of the liturgies of the Word and Sacrament. 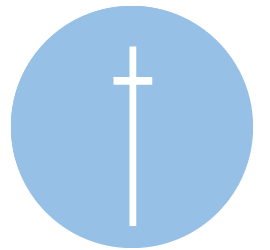 9:00 a.m. Christian Education for all ages: Sunday School and Adult Forum. Fellowship and refreshment too. 10:00 a.m. Holy Eucharist, Rite II: A service for those who enjoy a mix of generations, music and liturgies. a Children’s Chapel is offered during this service. It mimics the traditional liturgy with a homily directed to those in the 3rd grade and younger. Our nursery is open on Sundays from 7:45 am through the 10:00 am service, for children up to age 3 years. Parents who take advantage of the nursery sign-up to work at the direction of our Nursery Director, Mrs. Reita Turro, a licensed and loved childcare professional.